I'll be coming at this build again later with a more specialized motor and power pack, likely the graupner Louie used on his build, and setting mine up in much the same fashion. In the mean time, I've come up with some dirt simple designs to try on my a pack. One is a regular wide delta with a slender delta shaped vane atop the vertical stabilizer. I don't know the terminology for this. 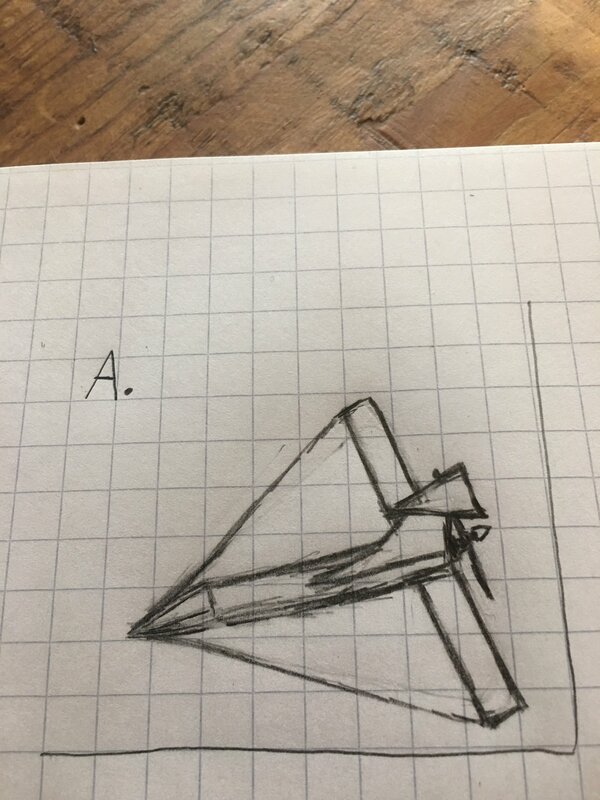 It's like a t tail but with a delta on top rather than a t. The other idea is a half circle flying wing, basically half a nutball with a wider wingspan and elevons instead of elevator and rudder. There's my basic delta. Didn't include the thingy on the vertical stabilizer. That should fly great! More streamlined and wider wings. You will have a winner! And yet it was aweful too. I'm not sure if something might actually be broken and not putting out the right thrust because this one could not maintain lift or climb either. Maybe I had to add too much nose weight to compensate for the bad cg. Try moving your battery back a little bit and try again. Or try a test glide where it is at now. If it dives when you hold full up then your plane is way nose heavy! I can perhaps try tomorrow it's pretty banged up. When I was flying it it didn't seem to pitch down so much as just stall and not maintain lift. If it really is a weight or cg issue, my best bet is to just use a tractor prop rather than a pusher on the standard delta. This a pack has crashed in the desert dirt so many times ,not to mention been repaired, so I'm starting to suspect it might just be getting kinda wonky. I think pretty soon, Im just going to get one of those graupner motors or something very similar, and build a slender delta near exact to Dr Loopin Louie's setup. The way he has the prop set up is, in my opinion, the best way you could possibly have it on a non edf build. I'm no expert will that work with a five inch three bladed prop? Because that's what I need for the high mounted pusher, not 6x3. I'm done using slotted props for the slender wing, they reduce lift, wing surface, structural integrity, and they are more work. I have only seen one good slender delta that used a slotted prop. IMO it's not the way to go. I believe that will work. You should go on hobby king and look for a motor of that size and see the specifications. Concept is simple, though somebody more experienced would probably execute it better than me. Take a nutball/gymball, widen the diameter some, cut it in half, make the dihedrals smaller but more drastic, make it a pure elevon build. There you go, you got the half-moon flying wing. Also, hobby zone Trojan got delayed a bit. Should be here by Monday. As much as I want to build my own stuff, I'm pretty hopeful and looking forward to just learning to fly well with a nice easy plane. Does it fly ? Surely you have not had enough time to find out have you? Good luck with the maiden . If I didn't have such a long build list I would build one myself, another to add to the list?, perhaps. I don't know if mine will fly yet, I've got a wing cut out with dihedral and elevons marked out, that's it. That being said, I see no reason why the design, if executed properly, would not work. 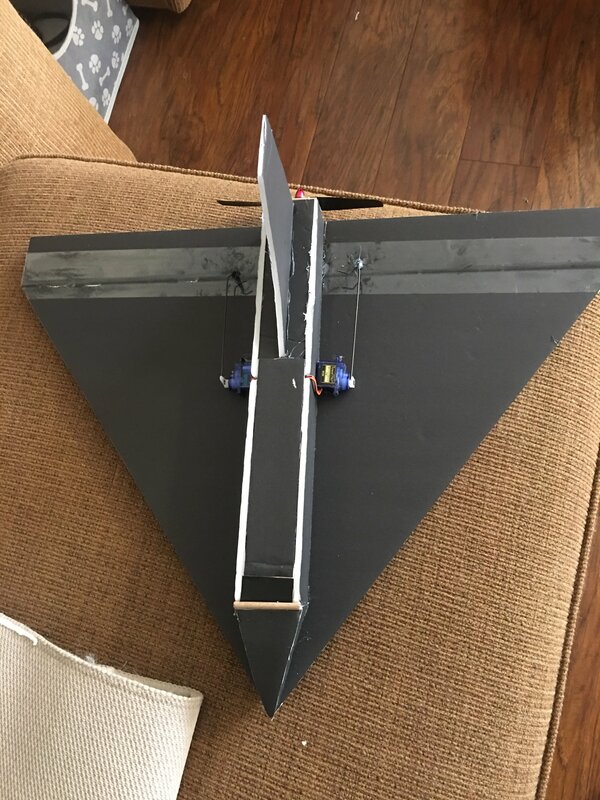 If I nail the cg, set up half way decent control surfaces, and don't actually have something wrong with my electronics, I'm sure it will fly.It's actually a pretty conventional flying wing in every respect-it's like a nutball mixed with a more basic design. I'm laying out everything for the first time, but once I get it fleshed out, it should be a super easy build anybody can slap together in a couple hours. I'm shelving the half-circle idea for a bit. I'll be getting together the right parts to build a slender delta design close or exact to Dr. Loopin' Looie's design. That being said, I may not put that first on my list of priorities, because I've got my mini hobby zone Trojan, and flying(and crashing) that has taught me a lot about where my skill level is at with fixed wing rc planes, and its given me a feel for the qualities that I will really want in a first real foam board build. The slender delta is definitely something I'll want eventually, maybe even soon, and it doesn't look terribly hard to build and fly, but I'm leaning towards something more basic first to help me get my bearings. I want something that flies very slow but turns and moves very agile. I believe the FT flyer is supposed to be pretty good for that, so I may go that route, but this slow flying delta looks like a great place to start too. When learning flying with a regular plane, you first learn to control your elevator and rudder or ailerons, and you also learn how to use your elevator to keep the speed right and not slow down too much and stall. You dont really care about your throttle. You can especially see this in gliders, there you have no throttle and use the elevator for changing your speed. That is the most basic flying to learn and thats why learning with gliders isnt too much of a bad Idea, because gliders can make you a better pilot. The slender delta however is completely different: no matter how hard you pull your elevator, as long as your throttle is on, you can fly at any angle of attack youre fancy and the plane wont stall. In fact, you can even do whole controled flights with only full up-elevator. Thats because on high-alpha maneuvers, your throttle becomes equally as important as your elevator. But entry level pilots usually get confused when they need to use the throttle precisely. For an experienced pilot, its very easy, but for a beginner, its too much. Its better to learn to use one control input at a time. Also, If you can fly a regular airplane, you can fly a lot bigger range of models than If you Just focussed on the slender delta, which is very unique. In my opinion, you should learn control Inputs in this order: 1.elevator, 2.ailerons, 3.throttle and rudder, 4.ailerons and rudder coordinated, 5.everything together. I hope that you learned something and that you understanded it, but before flying something unique, its important to get the right skills. And If youre looking into a cheap trainer, a small discus launch glider can actually teach you more about flying, momentum, speed, energy etc. than you think. I Just got the E-Flite Whipit, and actually I was impressed by how long the flighttime are with a simple toss. But you should be ok with your trojan. Does it still live? The Trojan still lives after quite a few crashes and repairs, including one where the whole front end busted into jagged pieces and I had to glue the whole thing back and wrap it in black electrical tape. A wing broke too and I glued it back. Even after that, I have to set the battery the farthest back it can go for good cg now, but it still flies good. I'm flying only on safe mode for now, because besides one time I flew in the wind, all my crashes were trying to fly without safe mode. Part of it is my skill, part of it is that I don't think the Trojan would be a particularly good beginner plane without the safe mode as it's pretty finicky and easy to crash. Other than that, I'm learning a lot with the Trojan on safe mode about elevator, elevons/ailerons, and rudder. All the controls are limited in their throws and it auto corrects if things get too extreme.I'm messing with throttle a bit but just for speed not for angles of attack. I can combine the elevons and rudder for tighter turns, as tight as safe mode will let me make. As long as I stay in safe mode it is pretty hard for me to crash or lose control now. As far as builds I'm looking to make a plane that flies as easy as possible without depending on safe mode. I'd prefer to start with a yank and bank, pure elevon three channel build. 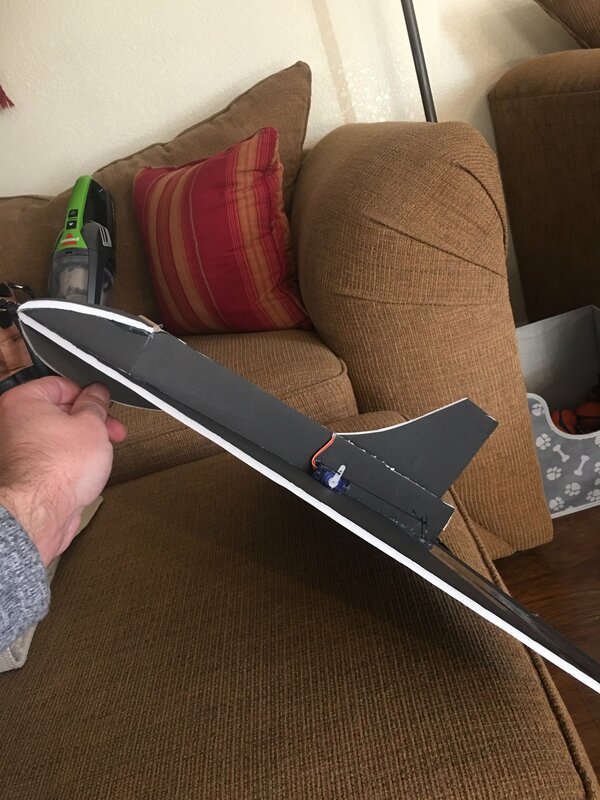 Right now while I decide what kit or plan I want to try and what parts I want to use, I'm messing around with building better fuselages for my scratch builds. 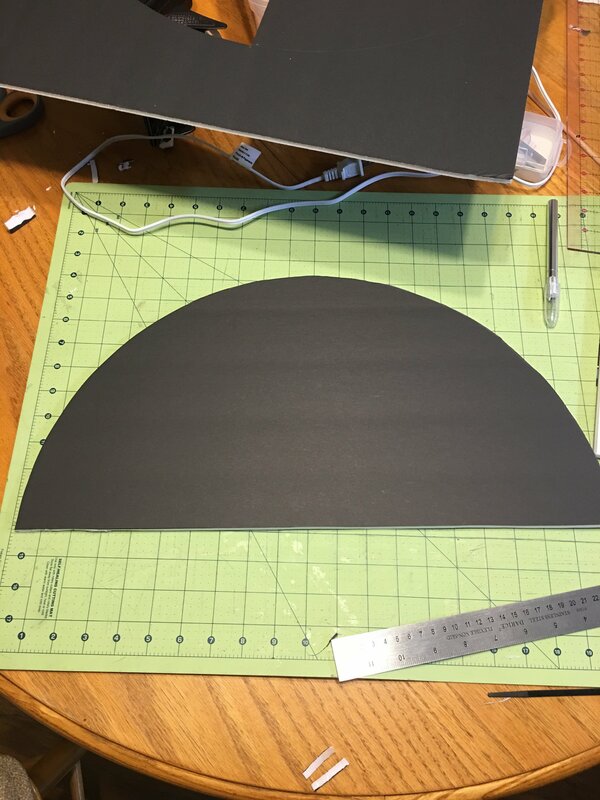 I've developed a template for a good high mounted pusher fuselage designed for 6x3 props, using a couple actual building techniques from FT/ the Dr.
@Vimana89 its very hard to find a good beginner plane that uses elevons. Bank and yank No problem, I would recommend building the AP Eazy by AiRC Pirates, but without rudder and with ailerons. It should fit your A-pack. You can also build the glider version of the tiny trainer. If your reinforce the wing Joint, its a decent DLG, at least for a foamboard only build.